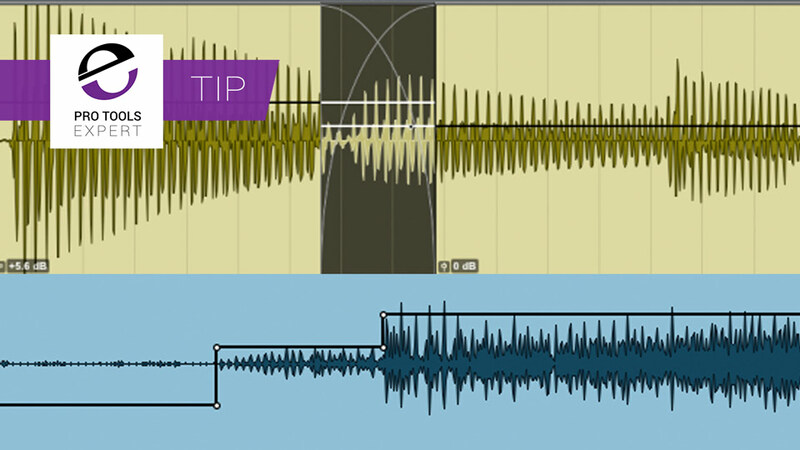 For many users clip gain was the new feature in Pro Tools 10 which changed workflows overnight. All of a sudden inserting trim plugins or using Audiosuite to render gain changes seemed very old fashioned. For me it was definitely a case of why didn’t we have this before? Doing music work, clip gain is not something I use constantly but I really value when it is there. As a result of it not being in constant use it was a while before I investigated keyboard shortcuts but when I did, I found them so straightforward it was no effort to commit them to memory and I could become less mousebound. Cntrl+Shift+Hyphen - Show/hide clip gain line. It helps to remember this as a variation on control+hyphen - toggle waveform/volume playlist. It can look a little like you are looking at a standard automation playlist when displaying the clip gain line but the clip gain line is the only automation playlist you will see where the waveforms haven’t been faded back. As well as using the clip gain info icon to access the clip gain fader to adjust clip gain remember you can use the trim tool when mousing over the clip gain line. When using the Smart tool the Select or Grab tools change to a clip gain Trim tool when mousing over the clip gain line. Cntrl+Shift+Up/Down Arrow - Nudge clip gain up/down in 0.5dB increments, to change the default go to the editing page of your preferences and look for “clip gain nudge value”. Cntrl+Shift+Num Plus/Minus - A variation on the standard nudge command, also accessible using the command focus nudge shortcuts of M, comma, period and forward slash if you are on a laptop. This is great fun watching the waveform heights update in real time to reflect the clip gain setting. Essential Clip Gain Shortcuts - Clip Gain or Waveform Zoom? It is possible to have dual clip gain lines in crossfades. This makes perfect sense, they reflect the clip gain settings for the outgoing and incoming clips. The crossfade’s clip gain can of course be trimmed independently of the parent clips and the two clip gain lines will reflect any changes made while maintaining their relative offsets. I find Clip Gain has been a more regular part of my workflow now that I am controlling it using these few shortcuts. Bear in mind that you can have multiple breakpoints and levels within a clip and selecting and trimming clip gain as well as dynamics processing and volume automation all sit together seamlessly in the production process. How did we get by without it?